This page shares ideas and “solutions” that might be useful to professional volunteer coordinators. Contact Tony Aloise if you want to discuss any of these topics or have a volunteer problem to solve. We want to work with both organizations that need volunteers (customer) and those that encourage volunteerism (supplier) such as churches, businesses and school. Volunteer NKY…leverage Facebook and blog for ongoing cultivation. Engage “outreach ministers” or people who encourage volunteerism. Mentoring…Volunteer Assessment Tool, Life Purpose worksheet. Introduce “brokering” services such as Volunteer Match, ESSC…Links on Member and Public site. Introduce to member agencies via informal networking/mentoring-based matching. Development plan…see Volunteer Development Playbook or Career Plan Template. Coach people seeking reemployment to develop resume-building volunteer proposal. Career coaching for agency staff (see Career Planning Worksheet). Develop generic position descriptions: grant writer, data manager, facility manager, research, volunteer coordinator, awareness (to match with high-level volunteers). Engage in agency client volunteer encouragement, e.g. Candidates at LLC. Develop a process whereby Corporations can propose a group (team) volunteer experience. Life Skills including Leadership. See the Life Skills Wiki. Organization design…framework, example, PACE (template, training). Program management…best practices framework, program plan. Process documentation…process masterplan, process documentation, training for your staff. Org specific examples…St Joe’s Outreach proposal, LLC Member Engagement. Volunteer NKY… Vision, Connect, Solutions, Facebook. 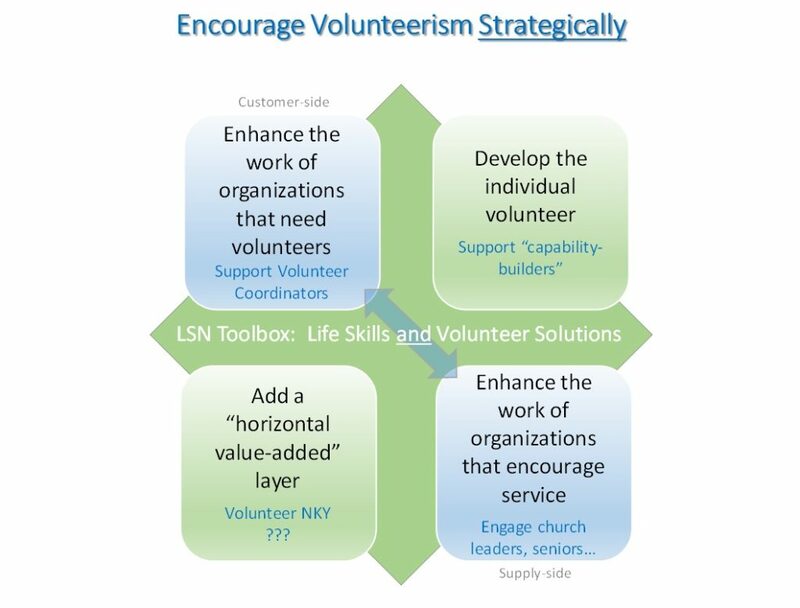 Volunteer development playbook…assessment tool for “fit, interview prep, development. Mentoring…of volunteers, of volunteer coordinators. Role descriptions…examples, what makes a good description.